Can the UK Greens win any more seats? Now electoral reform for the Commons has been defeated, First Past the Post (FPTP) is with us for the foreseeable future. I was never convinced that Alternative Vote (AV) would be a game changer for smaller parties, but the current system is particularly bad for them. There’s no doubt that FPTP exaggerates results. Below a certain share of the national vote, parties get fewer seats than they would under a proportional system. Above that level, they get more. Yet the Greens do have one MP, and they are in fact less hard done by under FPTP than the other UK-wide parties of similar size: UKIP and the BNP. In the 2010 election, the Greens nationally won 286k votes (1.0%); UKIP won 920k (3.1%); and the BNP 564k (1.9%). Yet of the three, only the Greens won a seat. So, why was this the case, and what are the Greens’ prospects under FPTP? To win a seat in a multi-way marginal, a party typically needs at least 30%. Caroline Lucas won Brighton Pavilion with 31%; the next target for the Greens, Norwich South, was won by the Lib Dems with 29%. Yet, with a lower national share than UKIP and the BNP, explanation is needed for why the Greens were able to mobilise 31% in a particular constituency, while the others were not able to do so. At least part of the answer is suggested by the huge poll conducted by Lord Ashcroft, in particular the question on how likely respondents are to vote for various parties, on a 10-point scale. The proportions who say they are extremely likely (let’s say 9 or 10) to vote for each of the three small parties is roughly what we’d expect: small, and similar to one another. So both the BNP and UKIP have much more of the electorate firmly against them: 84% and 68% respectively, compared with 55% for the Greens. If we return to a figure of around 30% needed to win a multi-way marginal, it is clear why this is so hard for the BNP. 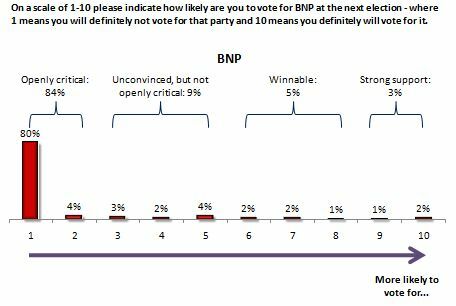 Nationally, 84% wouldn’t even consider voting BNP, leaving very little to play for. 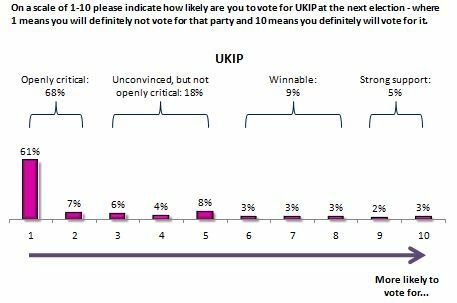 Even for UKIP, to reach 30% of the electorate, the party need to go all the way down the scale to people who say they are just 3/10 likely to vote UKIP. 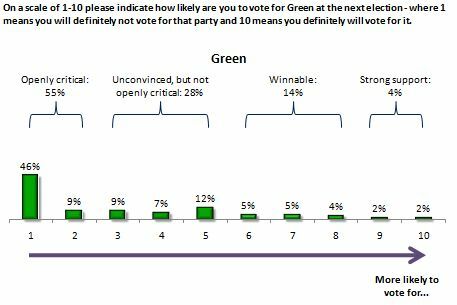 Yet for the Greens, winning 30% requires going down only as far as those who are 5/10 likely to vote Green: a much less daunting prospect, suggesting that future seats may be winnable for the Greens. Some caveats are important. Firstly, this makes an assumption of uniform national distribution. Clearly that isn’t the case: it’s an approximate model. Secondly, I’ve treated each party’s scores on these scales in isolation, when that isn’t quite right. A respondent could have said they were 10/10 likely to vote for several parties. What this shows is potential support, not guaranteed support. For the Greens to win more Westminster seats they would need to take support from the major parties. Given their relatively wide level of latent support, this may be within reach even under the current electoral rules. This entry was posted on Monday, May 30th, 2011 at 12:40	and is filed under Climate Sock, Politics. You can follow any responses to this entry through the RSS 2.0 feed. Both comments and pings are currently closed.